This museum quality replica of the Dapper Tom topsail schooner is a highly accurate and detailed scale model yacht designed for the discriminating sailboat enthusiast. 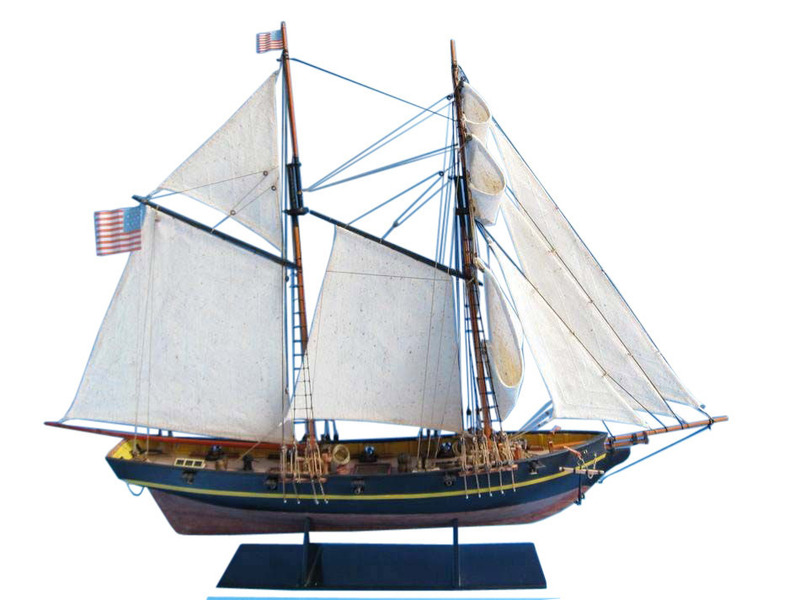 This fine tall ships model of the twin-masted clipper ship has been outfitted as a privateer during the War of 1812, and is perfectly sized for any small shelf, desk or mantle. Legal pirates. That's what privateers really were. Private ship owners could buy an official license from the government at times of war. To harass the known enemy. While 'accidentally' taking other prizes as well. Only the fastest vessels would do, light and nimble ships, simple armament. Speed and surprise were key elements of privateer tactics. The well named 'Dapper Tom' is one of the most elegant Baltimore Schooners ever built. The Dapper Tom, an 8-gun topsail schooner, is to great extent, typical of Baltimore Privateers of a stormy decade when ships were at the mercy of any stranger, and even armed ships were safe only in proportion to their nimbleness.